A DBMS provides many tuning knobs that, even for human experts, it is challenging to quickly find a better, let alone the best, configuration. Here, self-tuning is capable of performing the necessary tasks just in time. A typical approach for self-tuning is to employ a cycle of system monitoring, performance analysis, and configuration adjustments. Moreover, simulation-based approaches are used to estimate the effects of configuration changes. So far, research focused on self-tuning techniques for relational DBMSs and missed to face the emerging challenges imposed by the increasing demand of processing XML data natively with DBMSs. 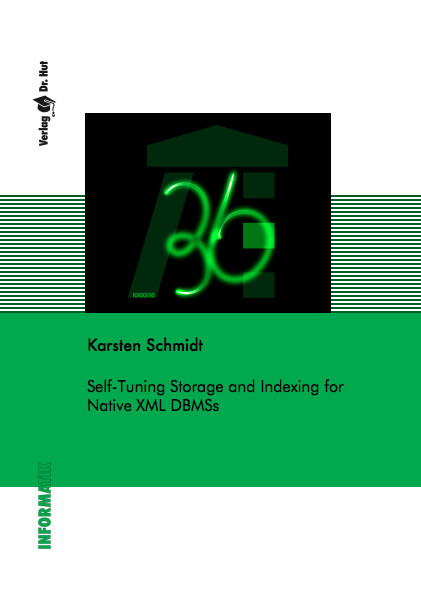 In this work, we investigate self-tuning techniques for native XML DBMSs (XDBMSs) in the context of our prototype “XTC – XML Transaction Coordinator”. In the course of this work, we present and benchmark our self-tuning concepts for XML storage, indexing, and processing. Therefore, we developed a full-fledged monitoring framework embedded into XTC. The typical, layered architecture of a DBMS guided our way of exploring tailored self-tuning techniques. We developed algorithmic extensions for database buffer self-tuning that provide nearly accurate performance forecasts. Based on our hotset simulation, we improved the decision support for buffer pool resizing. Other techniques to optimize the IO load are related to XML storage. We present our novel, space-efficient, and high-performance elementless storage mapping for XML data. Our associated path synopsis structure is a concise structural summary that plays a central role in storage and query processing throughout this work. Structural and content compression techniques as well as similarity measures for XML are exploited to (self-) tune the storage configuration. Based on our elementless storage concept, we built a unique and flexible set of XML indexing options. Besides XML “standard” indexing, we provide tailoring for content and structural aspects as well as clustering, compression, and document coverage. On top of our storage and index layers, we developed a query-driven Autonomous Indexing (AI) framework. It is integrated into XTC and exploits so-called virtual indexes and the query optimizer. Indexes are automatically created, maintained, and dropped, while all self-tuning decisions are supported by proper statistics about queries and their optimization potential. Comprehensive experiments and analyses regarding performance, overhead, and interplay of self-tuning techniques are performed based on real-world and artificial datasets.